Itanagar : Arunachal Pradesh, the amazingly beautiful state in Northeast India is celebrating the sixth edition of Mechuka Adventure Festival. 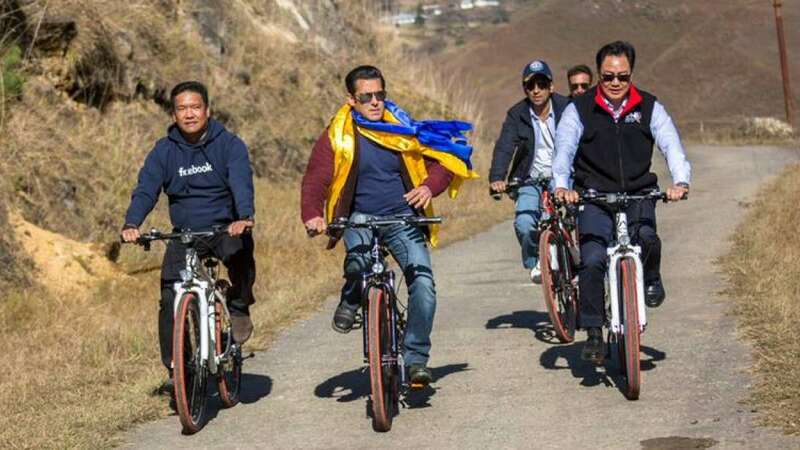 This time, Bollywood star Salman Khan, Union Minister Kiren Rijiju and Chief Minister of Arunachal Pradesh, Pema Khandu, cycled around the picturesque hilly terrains in the state, kick-starting the second edition of MTB Arunachal Mountain Bicycle Race in the festival. To inform, Salman Khan is an ambassador of Arunachal Pradesh tourism. To entertain all, Khan participated in a 10-km ride alongside the two politicians and several other dignitaries. The film actor was on a day-long visit to the state to promote tourism. Source of ANI shared a video and some pictures with us in which the trio is seen cycling through the hilly roads against the beautiful setting, where snow-capped mountains could be seen at the background. Also, MoSfor Home, thanked 'bhaijaan of Bollywood' for promoting adventure tourism. “People of Arunachal Pradesh will be forever indebted to @BeingSalmanKhan for promoting the State as a destination for adventure tourism. People showered him all the love & affection at Menchuka today,” Rijiju wrote on Twitter while sharing some photos online. The Mechuka Festival is organized every year by the Department of Tourism of Arunachal Pradesh and draws many adventurers around the globe every year.